Just a little tip - Susie at Bievenue is giving away a personalized sign. Don't despair if you don't win, because her Etsy shop is now open. She has the nicest hand painted signs. And the price! What a bargain. Wow. Were your holidays as hectic as mine? This was my first Christmas blogging, and I underestimated the lack of time that would be available to post. I didn't get to finish Grandma's Odd Cookie Parade. Maybe in the next few days. Yesterday, after balancing the checkbook, I headed to the store for some groceries. The crunch of Christmas was felt in my balance. As I wandered the aisles, I made a conscious effort to be extra frugal with my purchases. The cost of gas has fallen, but the food prices have not. I cannot believe that there are thirty beef cattle in my back forty, but I am paying $8.50 for two pounds of lean ground beef. Farmer Brown, are you listening? $8.50! After I recoiled from the price of the beef, I was extra careful with the chicken purchase. I have trouble with chicken. I could very well be a vegetarian because of chicken. The bones, the blood on the bones - gag - it gives me the heebies. This is why I can't lose weight - every diet recommends lean meat like chicken. I can eat chicken, but I have trouble with chicken with skin, chicken with bones, chicken with thick breasts - gag. But a whole stinking chicken was $3.48. I didn't even look at the pretty packages of the thin, boneless, skinless chicken tenders. They make me so happy with their absence of any reminder of chicken. Sigh...I plopped that whole chicken in my cart, chicken juice and all - gag. My friend, Ina had the recipe for the Perfect Roast Chicken. Ina's recipe called for several items like thyme and lemons shoved into the chicken's cavity. There was only one way into that cavity - gag. I wasn't putting my hand in there. So here is my modification of Ina's recipe. Place the rough cut carrots and onions in the bottom of a roasting pan. Rinse the chicken and pat dry -gag. Place the chicken on top of the onions and carrots. Brush the outside of the chicken with the melted butter. Salt and pepper the chicken liberally. Roast in a 425 degree oven for 1 1/2 hours or until the juices run clear or you can wiggle the leg almost off. Look how pretty it turned out. That was easy. The skin - the skin was all crackly and crunchy. I can handle cooked skin to some degree, I mean the Colonel at KFC can put some crunch on his chicken, but this was fabulous. I couldn't stop pulling the skin off and snacking on it - until I noticed the little hairs sticking up around the opening to the cavity - gag. That was the end of the chicken for me. I had peanut butter and jelly for dinner. I managed to debone the chicken - gag. I am going to make chicken enchiladas tomorrow. Hopefully, the sauce will drown the thought of the chicken for me. Hooray! I won cookbooks! Please go visit Mommy's Kitchen where I won the books. She has a recipe for dinner rolls made from a cake mix! There's a bunch of other fabulous recipes there also! Last night, Frick and I made grandma's Cherry Winks. These are not that odd, but they do have maraschino cherries and dates and cornflakes. It is a weird mixture, but it all works. You will need special equipment to make these - kitchen shears and a cornflake roller. Drain the maraschino cherries. Cut 13 maraschino cherries in half, then in half again. Chop the remaining cherries into small pieces. In large bowl, cream butter, brown sugar, sugar, vanilla, and almond extract. Add eggs; mix well. Combine dry ingredients and add to mixture. Fold in chopped cherries, dates and pecans. Form dough into small ball and roll in crushed corn flakes. Put one of the halved cherries in center of ball. Put on lightly greased cookie sheet. Bake in preheated 350 degree oven for 10 to 15 minutes. Makes about six dozen. Finished cherry winks - see the little cherry - it's "winking" at you. Those are peppernuts in the middle of the plate. I am trying to get rid of them. I am having Farmer Brown sneak them into work today. They'll eat anything. Over Thanksgiving, I was going through my mom's recipe box, copying recipes that I didn't have. A theme started to emerge in the traditional cookies that my grandmother serves every Christmas - they were all a little odd. This is one of my favorites - the biscuit cookie. They are convenient and super easy to make. I usually have canned biscuits in the fridge around Christmastime so that I can make these as needed. The only fancy equipment you need is a pair of kitchen shears. I keep a pair in my kitchen drawer for food stuff. I have to hide them from Farmer Brown who only ever needs scissors for things such as cutting burrs out of the dog's fur. It is important to buy cheap biscuits because the dough doesn't get too fluffy. I buy the cheap biscuits that are sold in packs of four cans, that have ten biscuits per can. I also buy the store brand candied cherries. I don't particularly like candied cherries, but they seem to work with the cookie. Mix the sugar, nutmeg, and cinnamon together in a bowl. Melt the butter in another bowl. Open your cheap can of biscuits and separate each biscuit into two layers. This will give you twenty biscuit rounds. Using your kitchen shears, cut the rounds like flowers. Dip the flower cookies into the butter, then into the sugar mixture, and place on a baking sheet. Bake at 350 degrees for 8 - 10 minutes, until they are golden brown. Here's the final plate ready to go to the neighbor's house. Saturday was a cooking disaster day. The plan was to make vegetable soup for the masses (or just the neighbors) and some sort of cookies to go with it. Farmer Brown was to pick up the borrowed stock pot. He left at 8:30 am. He arrived home at 3:00 pm. I was seething when I met him at the door. I finished my soup around 6:30 pm. 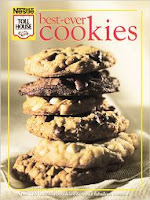 Remember that great book Like Water for Chocolate where her emotions end up in her finished recipes? My cookies came out tasting like frustration. My grandmother makes Peppernuts every year. It's a tradition. They were my Uncle Jack's favorite cookie. These hard, little bite-size cookies are excellent with coffee. The recipe was easy and it churns out about 200 cookies. Perfect for sharing. That's what I was thinking as I started. The recipe came together quite well, but my hand mixer was beginning to smell hot. The dough was dry and crumbly. There was no way this was going to roll out on the counter. I called Grandma to ask her to check my recipe. (Oftentimes when my mom gives me a recipe, she leaves out major ingredients.) Apparently, the recipe was correct, it just takes lots of time and muscle to get it together. Grandma never owned a Kitchen-Aid, though. I switched machines and the dough began to stick together. My mom always ices her with a simple powdered sugar icing and then tops them with a cinnamon candy. My icing was too runny. In the end, I put them in a container and sprinkled powdered sugar on them. No one in the house liked them. I am only sharing the recipe in hopes you have your own, easy version to share with me. Beat eggs and brown sugar . Sift and add flour, baking powder, cinnamon, and cloves. Roll out small pieces on floured board like making snakes with play dough, roll until the thickness of your middle finger. Cut into 1" slices. Bake at 300 degrees for 30 minutes. Ice and decorate. I don't plan on making these again. It's time to get rid of some Christmas traditions. Tomorrow, cookies I like. Cookies that are easy to make. Thank goodness. 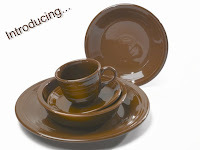 Jaci is having a Fiestaware giveaway over at her site Ravings of a Mad Housewife. You may think at first that you are just visiting her site for the giveaway, but you will end up staying for the insightful, humorous posts. This beautiful, rich chocolate brown. This is not the color scheme of my kitchen, but I think I could change things up for this. Wouldn't this look pretty mixed with the white? Or the turquoise? The possibilities! **I am currently backed up with containing the holiday spirit in middle schoolers, but I am planning on some cookie baking this weekend! Stay tuned for my parade of Grandma's Odd Christmas Cookies. Ritz crackers! Canned biscuits! Oysters! Cornflakes! I know you can't wait! The recipe called for pears, but I substituted apples. This was only my second time working with puff pastry. This makes two loaves. The first one was sad looking. It didn't get very "puffy" as one would expect puff pastry to be. The second one got maybe a centimeter puffier. The cook at school recommended not filling it as full. This does make a lot of filling. Next time, I would try making three to spread the filling thinner or cut the filling in half. Mix apples, pumpkin, brown sugar, pecans, cinnamon, cloves, and ginger in medium bowl. Spooh half of the apple filling down the center 1/3 of 1 pastry sheet. Make downward slanting cuts in outer edges of pastry about 3/4 inches apart, cutting from outside edges to within about 1 inch of apple mixture. Starting at top, fold side pastry strips alternately over filling, forming chevron design. (I am desperately wishing for Christmas for my camera. This looks exactly like my pastry.) Seal top and bottom ends of strudel. Place on baking sheet. (You know, I just assembled mine on the baking sheet. I could picture me trying to get floppy dough from the counter to the baking sheet.) Repeat with remaining apple mixture and remaining pastry sheet. Brush both strudels with egg; stir together the 1/4 c. sugar and 3/4 tsp. cinnamon and sprinkle on top. Bake at 375 degrees for 25 - 30 minutes or until golden brown and puffy. Cool slightly on baking sheets. After all the gluttony of Thanksgiving, it is time to get back on track with eating well. This is one of my favorite WW recipes. I usually fry the whole package of turkey bacon. At my house, I have to hide my four slices or they will be gone before I finish the recipe. I have made this without the bacon and enjoyed it, but the bacon adds a little smoky flavor to the tomatoes. As a side note, as I ate this and felt all smug and good about eating something semi-healthy, I had a new recipe in the oven - Pumpkin Apple Strudel. I will have to try a small piece tonight for blog's sake. Post the recipe tomorrow! Cook bacon in large skillet over medium heat. Remove bacon from pan, reserving 1 Tb. drippings in the pan. (Because the turkey bacon doesn't leave as much grease, I will add a little water or olive oil to the pan.) Add onion to drippings. Saute 3 minutes. Add mushrooms and garlic; saute 4 minutes. Add tomatoes and next 4 ingredients. Bring to a boil, reduce heat, and simmer 5 minutes. Meanwhile, prepare the pasta according to package directions. Drain and add to sauce. Sprinkle servings with crumbled bacon and fresh Parmesean cheese. Serving size is 1 cup. WW points per serving: 4 points!! There's so much Christmas love going around the blogworld today courtesy of the SITS. To spread the Christmas cheer here, I wanted to share with you a holiday tradition in my family. Every Christmas Eve was spent at my Grandma Gussie and Grandpa Friday's house. Their house was tiny, but with nine children and their families, there would be at least 50 people crammed into the living room/kitchen area with the kids overflowing to the bedrooms and laundry room. Papaw was a coal miner all his life and proudly heated his house with a small coal stove. He would stoke that fire to blazin'. The windows and doors would all have to be open. Sadly, Grandma and Grandpa both passed away a couple of years ago. Grandma was a simple woman, so don't expect something extravagant. I can't drink this and not think of her. **Please forgive me - You might be a Redneck if your fancy party punch recipe includes two packages of Kool-Aid. I am without a camera until Santa shows up on Christmas morning. You'll need to use your imagination today. So picture this - I just hosted the saddest little giveaway in blogdom history. Sad for me that only three people entered. Good for those three people that entered! Thank you so much for stopping by. I actually have a few other books to give away in the next coming weeks. So stay tuned! Please email me your address at BrindiAnderson@hotmail.com and I will get your hot, little Bobby Flay book right out. Heather is a newlywed, so I'm sure she has all new kitchen stuff to work on exciting new recipes! So picture this - I remembered at 9:30 pm last night that it was a coworker's birthday today. You know the one, the coworker that always makes everyone's favorite cake for their birthday. She couldn't go without a cake. So I made a simple recipe for a Mounds Bar Cake. By the time the thing was finished at 11:00 pm, I was a little sleepy. So picture this - this morning it looked as though it had snowed in the kitchen. Apparently, there was a hole in the coconut bag. There was coconut everywhere. I was so tired, I hadn't even noticed. On second thought, I'm glad I didn't have a camera. It wasn't a pretty site.